The velvet tag collar is commonly ordered without the D ring, as it is for tags only and should not be used for walking your dog on lead. I have been doing this type of tag collar for many years, it is designed with the comfort of your dog in mind. A velvet collar is soft everywhere you touch, and generally will not irritate dogs with sensitive necks. A Martingale collar should NOT be left on while your dog is unattended, and no collar should be used when crating your dog. A tag collar is a safer option if you want to have ID on your dogs while at home. When you purchase a beautifully trimmed collar for your dog, you are making a small investment. I liken the decorative collars to expensive cars, the TAG collar is your insurance! The tag collar should be worn around the house, not the walking collar. Your nicer collars should be stored with your leashes, and only worn for outings and special occasions. 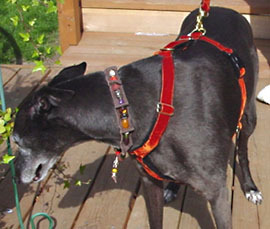 The two collars should be worn together, as a set, when the walking collar is needed. This will keep your more expensive collars nice for a much longer period! This will ensure a proper fit. 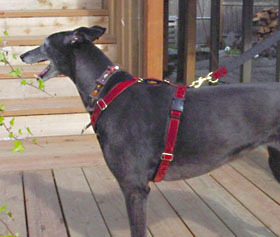 The harnesses are adjustable at all points, and are softly lined with a light fur lining for maximum comfort. Velvet trim is suggested, it wears better and is much more comfortable for your pup. We use solid cast brass hardware that is sturdy yet light enough to maintain the level of comfort expected. Our harnesses are made to sit well back from the front legs (see Foxy below), so they do not cut in and cause discomfort, or you can adjust it closer to the legs if you prefer (see Easy below). Our customers LOVE our harnesses, and we do too! 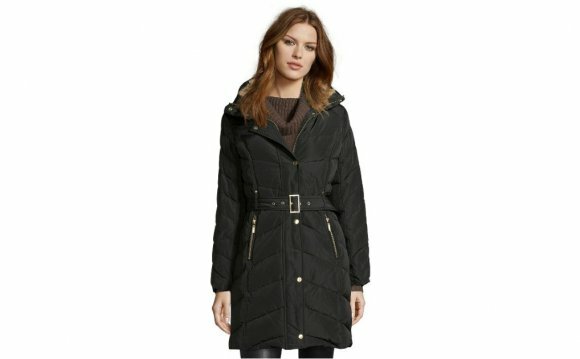 Base Prices: $60.00 for Velvets. Plain webbing available for $30 in black, burgundy, royal blue, purple, and forest green. Plain web harnesses will not be lined.